Copper caps made by progressive die deep drawn stamping with high precision, which are used as cap on fuse or loudspeaker, capability is 700000pcs daily. For such small caps, we will design and fabricate progressive die with purpose of high productivity and super low production cost, but tight tolerance, this is the best option for your small stamping parts with fast delivery and stable quality. 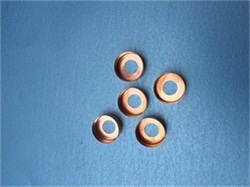 Copper or brass caps can be widely used on battery, louderspeaker, lighting, and other electronics. 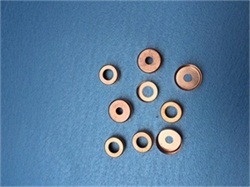 Copper have super good conductivity, we manufacture many kinds of caps using progressive dies on imported pneumatic press, precision can achieve +/-0.03mm, high productivity and high precision are the main feature of our progressive die stamping, it can be up to 100000pcs per day, and it depends on the structure of the parts, with such high productivity, the price would be very cheap. Progressive die stamping is one process in metal stamping industry, in one shop, we can do composite tools stamping, deep drawn stamping, spinning, progressive die stamping, and high speed precision stamping, please check with us for your such demand.